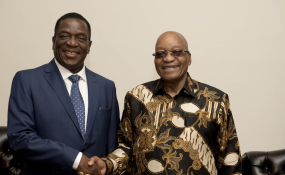 President Jacob Zuma and his Zimbabwean counterpart, President Emmerson Mnangagwa, met in Pretoria on Thursday to discuss ways to strengthen bilateral ties. The two Heads of State used their meeting to share perspectives on various issues of mutual importance, such as regional, continental and international developments. President Mnangagwa is on his first working visit to South Africa since his inauguration in November. He replaced former President Robert Mugabe, who resigned after military and public pressure put an end to his 37-year stay in power. President Mnangagwa will serve as interim president until August 2018 when Robert Mugabe's term was set to expire. Thereafter, the people of Zimbabwe are set to elect their next leader. Speaking to the media after their talks at Mahlamba Ndlopfu, President Zuma's official residence in Pretoria, the two reflected on November's developments in Zimbabwe which President Zuma said were handled with maturity. "We are very grateful for that because in a number of countries if the army decides to stand up, they leave a trail of destruction generally, but in Zimbabwe, they were able to bring it under control," said President Zuma. He said he was assured by President Mnangagwa that the former President Robert Mugabe will be looked after, especially taking into account his contribution to the liberation of the Southern African region and the decolonisation of the continent, and will always be acknowledged and celebrated. President Mnangagwa joked that he was happy to be back in South Africa - the place in which he found refuge when he was fired as Deputy President last month. He also used the opportunity to reflect on the cordial bilateral relations both countries share, underpinned by strong historical and political bonds that date back to the era of the liberation struggle. President Mnangagwa's visit to Pretoria comes just a day after his national address to a joint sitting of the National Assembly and Senate since becoming President where he voiced his government's commitment to building a democratic, united Zimbabwe. "My government is committed to entrenching a democratic society driven by respect for the country's constitution, rule of law, mutual tolerance, peace and unity," the President said. He reiterated that his government will have a zero tolerance for corruption in order to grow the struggling economy. "Economic growth requires a clean government, a clean private sector. The goal of my government is to build a new Zimbabwe based on values of transparency, accountability and hard work," he said. He further expressed optimism about next year's growth prospects driven by anticipated strong growth in agriculture and mining. South Africa and neighbouring Zimbabwe's diplomatic relations are marked by the annual convening of the Bi-National Commission (BNC) signed in 2015 and co-chaired by the two Heads of State. Zimbabwe is one of South Africa's top five trading partners on the continent, with trade statistics showing annual growth. In 2016, South Africa's exports to Zimbabwe amounted to approximately R29.3 billion.